Belleek China ornament is woven in basket motif. The Belleek basket weave ornament was introduced in 2015. 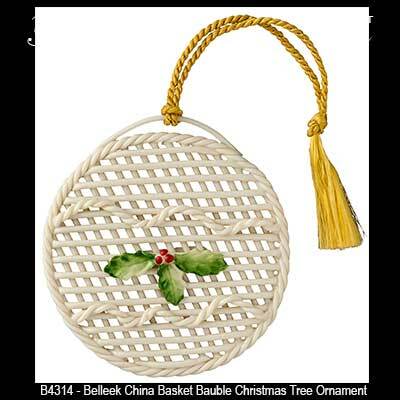 Belleek has woven strands of china to create the basket bauble. The Belleek basket weave ornament features hand-painted holly and berries and it is ready to hang on your Christmas tree with the included gold tassel. The Belleek bauble measures 3" wide x 3 1/3" tall. Belleek Pottery is instantly recognizable for its exquisite handmade baskets and flowered ware. We wish to introduce you to our new handmade basket ornaments. These delicate, lightweight Christmas ornaments are crafted entirely by hand in our basket and flowering department. The ornaments contain several elements of basket making. From the thin strands usually used to make the basket walls, here they are used to make the ornament shape. Twisting two strands together, they are added to the ornament shape protecting the delicate strand edges. Beautiful hand applied leaves, berries and flowered elements grace the ornament strands. The finishing touch on each piece is the decoration painted by hand by our craftspeople. 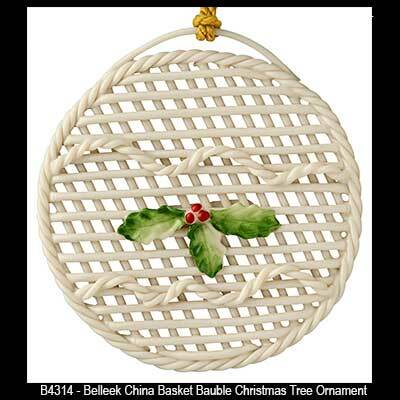 Belleek basket weave ornament is woven from china in the shape of a Christmas tree.